News of ancient Hindu temples, some as old as 1600 years, being discovered during redevelopment of the previously ignored holy city of Kashi/Varanasi, has sunk without a trace. Such is the apathy of our liberal elites towards the Hindu heritage which defines our civilization, that rather than featuring the Yogi Adityanath government for ending the systemic neglect of a city which is the symbolic heart of Hindu Dharma, we can instead expect editorials and opinion pieces on why this is improper use of Government resources. 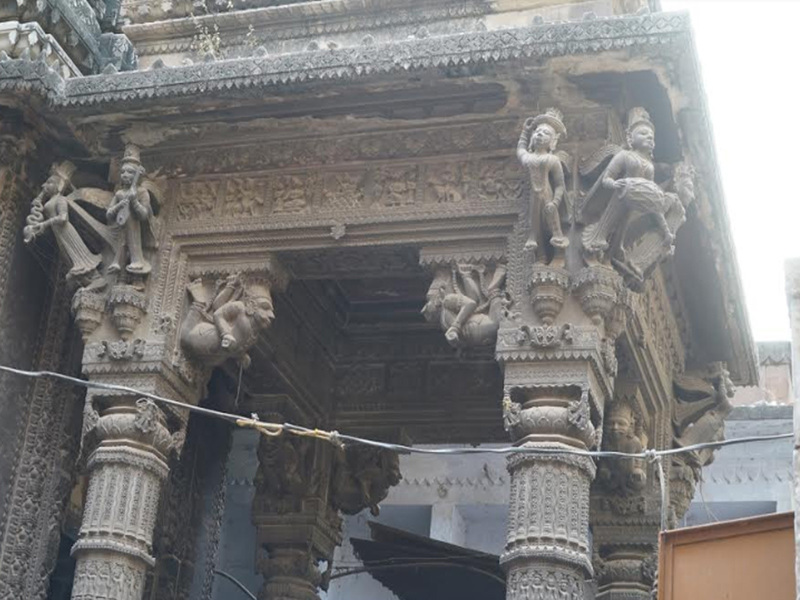 “Ancient temples with architectural marvels are being recovered during demolition of buildings for the Kashi Vishwanath Temple (KVT) corridor project. The structures being recovered during demolition are in such large numbers that a decision for developing corridor area as a complex of ancient temples has been included in the detailed project report (DPR) of the project. KVT chief executive officer Vishal Singh disclosed that the Ahmedabad-based company which has been assigned the project has almost finalised the DPR of the project. Mentioning the recovery of a temple of Samudragupta era, which had been completely hidden by walls to construct a house with toilet on its top, near Manikarnika Ghat, Singh said that 43 structures, including ancient temples, library and buildings of architectural importance, have been identified for preservation during demolition. Yogi government had sanctioned Rs 600 crores for the project after its approval in December 2017. The government had to tackle the issue of rehabilitation of tenants and shopkeepers affected in the process of purchasing 296 buildings and preservation of ancient temples, library and buildings of architectural importance. According to Singh, 175 of total identified 296 buildings have already been purchased of which around 40 have already been demolished while work is in progress on 60 others. Completion of this project will pave way for easy accessibility to KVT from the banks of river Ganga. The pilgrims will be able to reach KVT through Manikarnika, Jalasen and Lalita Ghats, while the Chhattadwar point will be opened for entry of vehicles. The main reception, police security system, ticket counters for aarti and prasad bookings will also come up there. Improving the basic infrastructure of holy towns like Kashi/Benares which attract crores of pilgrims each year, has been high on agenda of the present Government. Earlier this year, the ugly & dangerous sight of dangling power cables became a thing of the past for many residents of the temple town. Kashi Vishwanath (Vishwanath means ‘Ruler of The Universe’) temple is the holiest of Shiva temples, and one of the twelve Jyotirlingas. The temple has been referred to in Hindu scriptures for a very long time – it has been mentioned in the Puranas including the Kashi Khanda (section) of Skanda Purana. It has been destroyed by Islamic invaders and re-constructed by Hindus a number of times in history. 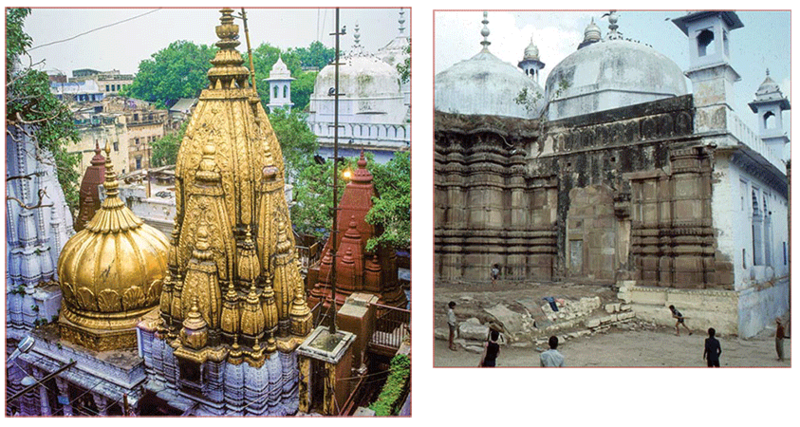 The original Vishwanath temple was destroyed by the army of Qutb-ud-din Aibak in 1194 CE, when he defeated the Raja of Kannauj as a commander of Mohammad Ghori. The temple was then rebuilt in the 13th century by a Gujarati merchant. It was demolished again during the rule of either Hussain Shah Sharqi (1447-1458) or Sikandar Lodhi (1489-1517). Raja Man Singh, a trusted general of the Mughal emperor Akbar, rebuilt the temple but many Hindus boycotted it as Man Singh had allied with the Mughals against Maharana Pratap and married his sister and daughter with the Mughals. Akbar’s finance minister Raja Todar Mal further re-built the temple at its original site in 1585. In 1669 CE, Emperor Aurangzeb destroyed the temple and built the Gyanvapi Mosque in its place. The remains of the erstwhile temple can be seen in the foundation, the columns and at the rear part of the mosque. The current structure was built on an adjacent site by the Maratha ruler, Ahilya Bai Holkar of Indore in 1780. As with all facets of Hindu heritage, left-liberal apologists have tried for long to distort the history around Kashi Vishwanath temple too. The first fabrication to justify Aurangzeb’s destruction of the temple came from Gandhian aide & Congress leader Dr. Pattabhi Sitaramaiyyah who concocted a story of Hindu priests molesting a queen in Kashi Vishvanath temple, thus enraging Aurangzeb who ordered the temple to be destroyed as it had been defiled. Incidentally, Sitaramaiyyah was Gandhi’s preferred candidate for Congress Presidency in 1939, but lost out to Netaji Bose. Sitaramaiyyah’s baseless tales have been repeated ad nauseam by ’eminent’ historians to such an extent that they have become staples in secularist circles. Recently, the American ‘historian’ Audrey Truschke, a Professor of Religious Studies in Stanford, California, has taken on the mantle of whitewashing Aurangzeb. While the redevelopment of Kashi under the Yogi Adityanath government is a welcome change for those of us used to chaotic & unclean Hindu holy sites, especially in the Hindi heartland, care must be taken that ancient heritage is not destroyed – a concern which has been raised in this IndiaFacts article. But with the news that the KVT corridor will now house a complex of ancient temples and ensure that 43 heritage structures are preserved, one hopes that concern too is addressed.